‘Good Morning To The Night’ by Elton John vs Pnau (Mercury Records) is the lead track from the new album of the same name, also out now. You may know Pnau from their breakthrough side-project Empire Of The Sun; Elton John has declared himself in awe of what they have done with a selection of his old masters which have been re-imagined into an album of recreations of his classic songs from between 1970 and 1976. ‘Scream’ by Dizzee Rascal feat. Pepper (Dirtee Stank) marks Dizzee’s return, and will be followed by his eagerly anticipated fifth studio album. Dizzee Rascal is one of the biggest and most influential artists UK music today with three hit albums and five number one singles in the UK plus countless accolades and industry awards under his belt including the coveted Mercury Music Prize, an Ivor Novello and Brit. Dizzee has been working with some of the biggest names in the scene on the new album due out late 2012 which will once again showcase his genre-fusing musical genius which has made him one of the true pioneers and influencers of the British music scene. Pepper is the latest signing to the Dirtee Stank label and is preparing for the release of her debut album next year. ‘Velodrome’ by Chemical Brothers (UMC) was composed specially for the Olympic Track Cycling events in the Velodrome. Facts and figures about the success of The Chemical Brothers over the 19 years since the release of their first single (Song To The Siren) come as thick as the Yellow Pages when collected together. To highlight just a handful: millions of copies sold of seven studio albums, five of which went to number one in the UK. They have also won multiple Grammy and Brit awards over the length of their career. When approached to write the official music for the Track Cycling events in the Velodrome, Tom Rowlands and Ed Simons had two initial considerations: firstly there was the long and fascinating history of the sport, and secondly there was Tom’s own personal interest in cycling. Embracing this response they set about creating something that would reflect “the sense of speed, pace and drama,” of the sport as well as the “incredible beauty” (Ed Simons Q Magazine interview), of the new London 2012 Velodrome’s architecture. The result is ‘Velodrome’, a thrilling, world-class track that will provide the soundtrack to six action packed days of competitive Track Cycling over the course of which 10 Olympic gold medals will be won. Tom says, "I have loved cycling since I was a boy. I have always made a connection between electronic music and cycling repetition, the freedom and sense of movement. Kraftwerk obviously cemented this connection with their 'Tour de France' track. For us to create the theme for the Velodrome is a great honour and we're really excited to hear it in situ." 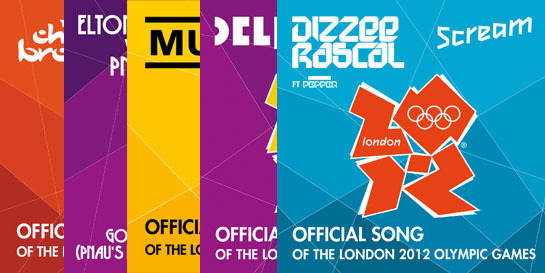 These four songs join Muse’s ‘Survival’ (Helium 3/Warner Music) to become the five official songs of the London 2012 Olympic Games sports presentation programme and part of the recently-announced Rock the Games music programme. A library of 2012 songs with five themes – ‘energy’, ‘primetime’, ‘extreme’, ‘heritage’ and ‘world stage’ – has also been compiled, with each theme tailored for specific sports, for example ‘heritage’ for Wimbledon, or ‘extreme’ for BMX. In addition, Rizzle Kicks and Mika are just two of the artists who are set to play surprise gigs at some of the Olympic venues once the Games begin on July 27th.